I remember back in 2011, my college friends and I (all of us Fine Arts students) were already expressing not-so-high hopes for Disney’s Frozen. Many of our complaints centered on it possibly being a bastardization of yet another fairy tale (Hans Christian Andersen’s “The Snow Queen,” about a little girl named Gerda rescuing her friend Hans from the Snow Queen), and possibly a rip-off of Broadway’s Wicked, considering that it was about two girls at odds and it had Idina Menzel playing the misunderstood antagonist. I was also a bit iffy with it, for I was expecting a traditionally animated Disney Renaissance part 2, not a seeming copy of 2010’s Tangled. I am so glad to have been proven wrong. Frozen exceeded all expectations. Frozen follows the story of two estranged princesses, Anna and Elsa, who have been shut away from the rest of the world by their parents due to the magnitude of Elsa’s ice powers, of which Anna has no recollection. On the day Elsa is crowned queen of Arendelle, the powers she has been trying to control and conceal all her life explode into public knowledge and Elsa runs off to the North Mountain, unwittingly creating an eternal winter. 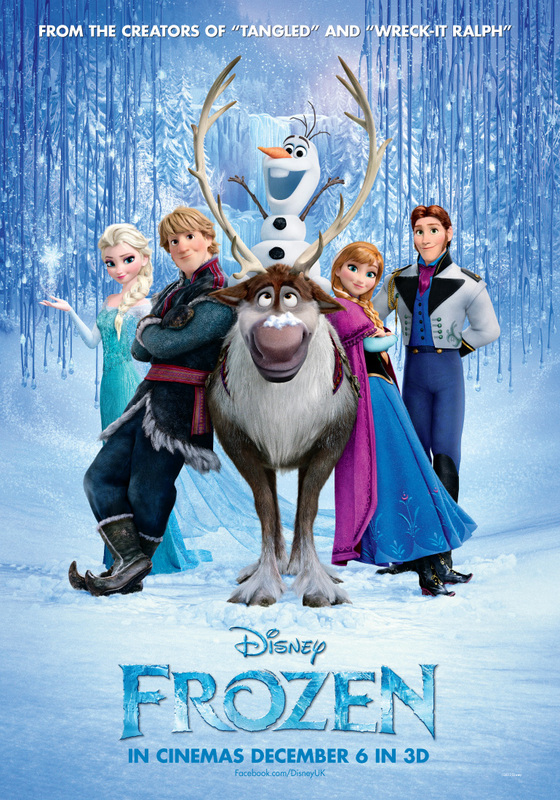 With the help of ice-cutter Kristoff, his dog-like reindeer Sven, and childhood snowman Olaf, Anna chases after Elsa in the hopes of reversing both the winter of Arendelle and in Elsa’s heart. As with all Disney movies, one cannot help making comparisons to previous works. The first thing to take me pleasantly by surprise was the amazing opening song “Eatnemen Vuelie” or simply known as “Vuelie,” a South Saami folk song rendered to soaring heights by Norwegian female choir Cantus. The last time Disney a movie opened this way was 1994’s The Lion King. Also, the film’s sensibilities were very Broadway too, from the music to some of the scene transitions–not really surprised considering the presences of Broadway actors Idina Menzel and Jonathan Groff. Even Kristen Bell, who displayed impressive musical chops, apparently got her start in Broadway. If I keep going off about the music, it’s really because I haven’t encountered a catchy Disney song since the opening of 2001’s Lilo & Stitch. My sister and I were dueting on “Let It Go” and “Do You Wanna Build a Snowman?” for the rest of the night. And those lyrics! “My soul is spiralling in frozen fractals all around”…clearly, “Let It Go” is my favorite song. The second thing that took me by surprise was the film’s first five minutes, which detailed the shared childhood of the princesses, sisters Anna and Elsa. Oh my god. By the time we got around to explaining how their parents died, big fat tears were rolling down my cheeks and off my chin–and it turned out that my sister and I were both trying to hide the fact that we were crying from each other. I’m pretty sure we could see ourselves in sunny Anna and frigid Elsa. My heart just broke when Anna sits before the door to Elsa’s room, singing a sadder version of “Do You Wanna Build a Snowman?” and just sighs out that last line. Ugh. You hear that, Disney? You just can’t. My face when I heard that line. Image taken from UKMix.org. The directors and scriptwriters, who apparently resurrected a project stuck in development hell for over 40 years, can pat themselves on the back for a job well done on Elsa’s characterization (seeing as their main problem was making the Snow Queen more relatable and relevant). Elsa is not only relevant–she’s such a broken, well-meaning, and very independent character, at least when she comes into her own. I loved her. I’d watch a movie about her. Idina Menzel did a good job sounding much younger, though I guess she couldn’t help it when singing–but what the hey, her voice sounds awesome either way, and it repairs the injustice of not utilizing her talents in Enchanted (2007). If Elsa wasn’t who she was in the movie, Anna would be my favorite character: clumsy, funny, spunky, very forward, and unafraid to stuff her face with chocolate (the only other Disney princesses I’ve seen actually eating something are Tiana, who loves to cook; Belle, who samples some confectionery cream during “Be Our Guest”; and Merida of 2012’s Brave). I guess what I’m trying to say is, she feels like a real person: for most of the movie, she’s hankering for somebody to love, almost at the price of ignoring the people who already love her. I’ll get back to Anna later. Kristoff, too, was a pleasant departure from your average Disney prince. For starters, he’s pretty grumpy–something Disney hasn’t done since the Beast in 1991’s Beauty and the Beast. I didn’t really have high hopes for him since in early pictures, he looked either gruff or somewhat dim-witted (and a far cry from dashing, funny Flynn Rider). But he’s got his heart in the right place and he really does care about Anna. His reindeer Sven is the sillier, doggier version of Tangled’s Max the horse…but with all these animal sidekicks with dog-like qualities, one wonders why Disney doesn’t just flat-out give them a dog. Olaf is more like Rey from The Princess and the Frog (2009) and oodles more charming, probably on par with…wow, I don’t think he’s on par with any past sidekicks with speaking roles. He’s much more. Sometimes I wonder if Frozen seems fresh to me because of the wonderfully upturned Disney tropes or because I’m seeing all these wonderfully upturned Disney tropes in a Disney movie. But at the end of the day, I guess it doesn’t really matter, because my initial reaction to it was a soaring kind of joy, helped along by a stressful week at work. Kudos also to that twist involving Prince Hans, I really didn’t see it coming. But I guess one of my favorite-ever surprises was how the true love’s kiss trope got turned on its head. One of the things that really bothered me about Disney movies, although they comprise most of my happy childhood, was that the princesses rarely save themselves or the day (and that’s why I adore Mulan and Tiana). Anna not only saves the day–she saves Elsa, thus saving herself. That’s got to be one of the most powerful messages of love and family and self-worth Disney has ever broadcasted. She’s got the most growth of anyone in the movie; Elsa realizing the key to controlling her powers was just a little too quick for me. I do have some minor quibbles with the movie. It doesn’t explain why Elsa has ice powers, much like the way Tangled explained Rapunzel’s healing hair (although there’s a deleted song somewhere on Youtube that mentions something about a prophecy, I just can’t find it at the moment). I also thought that Anna’s forgetting Elsa’s powers were going to play more of a role in the movie, or at least have a more dramatic return to consciousness–that would have made for some great drama, right alongside Elsa revealing to Anna the catalyst reason for why they lived like shut-ins for over ten years in the first place. I thought Kristoff was going to reveal how he saw his troll family reverse Anna’s Elsa-induced ice injury when they were all children–I was going to let that one go until I realized he probably heard the trolls whispering how the king and the queen were present with their daughters. Anna did tell him she was raised in a castle. Overall, Frozen has a lot of the heart, magic, music, and a good deal of the modern interpretations of love and female roles down pat. It’s not in traditional animation, which I adore, but at the very least, the computer graphics are very smooth (minus the part where Elsa’s braid phases through her arm, but I didn’t notice that the first time around). I hope Disney keeps it up for future movies. I’d agree that Elsa is the best character. It seems they struck gold with a character so complex and yet relatable… Then again, they did spend years rewriting her until they were able to get her right. Her story, and Let It Go in particular, really resonated with me. When you think about it, it’s amazing they were able to say so much in one movie. It felt like there was more humor in there than you would expect from traditional Disney. I respect and love a story that can flip between serious and tongue-in-cheek on a dime.